Aerial view of Mattawamkeag Lake in Island Falls, Maine. Relatively few travellers to Maine venture off the beaten track of the coastal region and venture into remote Aroostook County. Those who do are rewarded with breathtaking scenery, fascinating history, and welcoming Maine hospitality. Island Falls and the surrounding Northern Katahdin Valley are worth a visit at any time of year. Come to see Island Falls, Dyer Brook, Merrill, Hersey, Mt. Chase, Moro, Oakfield, Sherman, Patten, Shin Pond, Smyrna, Stacyville, and other towns in the area for a relaxing escape. Island Falls comprises 40 square miles of land and is home to approximately 800 residents. Located at the confluence of First Brook and the West Branch of the Mattawamkeag River, the town has deep ties to nature. One of the most interesting destinations in Island Falls is Bible Point State Park. This 27-acre park is found at the south end of Mattawamkeag Lake. When president Theodore Roosevelt was a young man, he visited the area with his friend Bill Sewall. Roosevelt would camp on the lakefront, hunt for game, and fish in the lake. Each day, he hiked to a point of land on the river to read the Bible and enjoy peaceful solitude. Today, a plaque marks the spot where Roosevelt communed with nature and with God. The Island Falls Historical Society has worked tirelessly to preserve the unique history of this area. Among the preserved homes are a restored potato house, a former jail house, and Tingley House, which was constructed in the early 1900s. Another home, built in 1894 and restored with original furnishings, is home to the John E. and Walter D. Webb Museum of Vintage Fashion. The museum features collections of antique clothing from the 19th and early 20th centuries. Water lovers will be thrilled to come to Island Falls, which features four beautiful lakes. Upper Mattawamkeag Lake, Mattawamkeag Lake, Pleasant Lake, and Caribou Lake surround the town. These lakes are popular paddling destinations for canoeists and kayakers. They are also excellent places to fish for trout or smallmouth bass. Island Falls is home to Va Jo Wa Golf Course, a world-class 18-hole course with a pro shop, driving range, and practice facilities. Rated the best public golf course in Maine by the New England Golf Guide, this facility offers unparalleled views of Mt. Katahdin. Island Falls is also popular with snowmobilers, who ride through on a section of Maine’s Interconnected Trail System. Patten and Shin Pond, located west of Island Falls, have several important attractions. The Bradford House, constructed in 1840, has four bedrooms, three bathrooms, a front parlor, a large dining room, two kitchens, and private quarters for staff. This enormous home is an excellent example of a Maine farm house; a massive 110-foot barn is also located on the 17-acre property. The house and five outbuildings are listed on the National Register of Historic Places. The home was turned into the Bradford House B&B, which is a charming place to stay in the Northern Katahdin Valley. The Patten Lumbermen’s Museum, located on Shin Pond Road, offers a unique look at Northern Maine’s lumber industry. The surrounding forests was once an important supplier of ship masts and paper mills. The museum documents Maine’ logging history with photographs, letters, antique logging equipment, and other memorabilia. 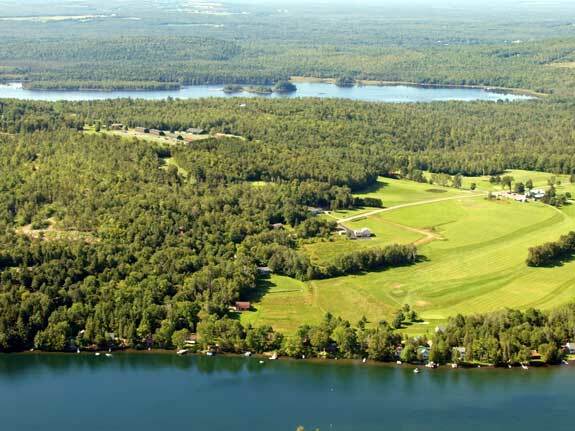 Shin Pond also offers a variety of recreational opportunities, including hiking, ATV riding, snowmobiling, snowshoeing, fishing, swimming, hunting, boating, and mountain biking. Consider hiking to Shin Brook Falls, looking for moose at Sawtelle Deadwater, climbing Mt. Chase, or taking a 26-mile canoe trip on the Penobscot River from Grand Lake Matagamon to Whetstone Falls. Whatever your outdoor passion, the Northern Katahdin Valley will not fail to disappoint. Visit the following directories to find lodging, dining, attractions, shops, services and recreational activities in the Island Falls, Maine area.